Saw the big blockbuster movie last week. Those of you who read Avengers Assemble! know the anxious excitement with which I was anticipating this film (by the way, for those of you playing along at home, it took 8 days to get to the theater, which, in parent time, is the equivalent of a single person missing the midnight premiere but making it to the 10 a.m. show the next morning). You may be wondering if and how much I liked the movie. However, those of you who are tbf’s of the blog know that I have little interest in writing straight-on movie reviews. The laws of physics and bloggers alike tell us that when two immovable objects meet, something’s gotta give. Hmmm, here’s an idea. Let’s treat this as though you and I just went to the movie together (Harkins Theatres, of course), and now we’ve arrived at Culver’s for a double-cheese ButterBurger and a concrete mixer, ensuring us plenty of time to hash out our reactions as well as draw curious looks from the restaurant’s patrons who can’t help but notice the two crazies in the booth who are way too excited about something. For those of you out there unfamiliar with Harkins and/or Culver’s, feel free to substitute your own favorite movie theater and burger/shake joint, although, in all honesty, it’s just not going to be the same. SPOILER ALERT: THIS IS A CONVERSATION ABOUT THE MOVIE. IF YOU HAVEN’T SEEN IT YET, AND WISH TO RETAIN YOUR AVENGERS VIRGINITY, STOP READING NOW. Location – Booth. Culver’s. Phoenix. USA. You: Alright, so tell me, what did you think of the movie? You: No, really. 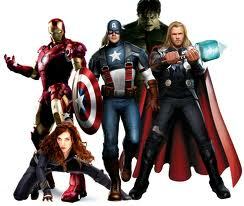 I want to know what you thought of The Avengers. You: So, what did you think? Did you love it? Me: Yeah, I think I did. You: You think? You’re not sure? Me: Well, I don’t know…Love, that’s a big commitment. You: Not. Besides, that’s a DC reference, not Marvel. You: Alright, let me try and spare you the angst by rephrasing the question. Did you think it was a great movie? You: Yes, great. As in better than good, and less than perfect. Me: Well, there are just so many levels to look at when deciding if a film is great or not. You: I don’t care about levels; I’m talking overall gut reaction. Me: I never trust my gut. And I’ll trust it even less by the time we finish eating. You: Stop dodging the question. Overall, was The Avengers a great movie? Me: Ahhrrg! I don’t know. I’m still thinking about it. Can’t we start with something easy, like the sound editing in the movie? You: Alright, fine. What’s your observation about sound editing? You: Oh my gosh, I don’t believe this! Why did I bother even going to the movies with you? Me: I don’t know. Because I’m so conscientious about not pilfering food from people while they’re in the bathroom? But I was just kidding about the sound editing thing. I really did have something to say. Me: So, I thought it was cool how they associated each hero’s weapon with a distinctive sound; you know, Thor’s hammer had that metallic ringing sound whenever he was about to use it, Hawkeye’s arrows made an electric whipping sound, Iron Man’s repulsors had a characteristic sound, Black Widow’s bracelet thingees (actually I don’t know if she ever used those bracelet thingees; she seemed partial to the nine millimeter). And I thought they way they mixed it in post-production was nice, you know? They didn’t overwhelm you with those sounds, but they were always there, providing these little auditory cues. It kind of gave your ears a way to help keep track of what was going on during those intense battle scenes. I thought that was smart, not to mention helpful at times. You: I guess so. I hadn’t noticed that. Me: See, I point these things out. Another reason why you like to go to the movies with me. You: Okay, so what else stood out about the movie? Me: Hmmm. Well, one thing I didn’t care for was the way they ripped up Manhattan the way they did. That bothered me. You: But that was all special effects, CGI stuff. You know that. Me: Yeah, I know it. It doesn’t mean I have to like it. You: But Marvel’s stories have always been set in real cities. It’s not like DC, with their fantasy cities like Metropolis, and Gotham City. Spiderman is a New Yorker, the Avengers are based in New York. They were just being true to the story, right? Me: I get that. I just have a soft spot for New York. Look, it’s no big whoop, I just don’t like seeing anything bad happen to the Big Apple. You: Is this a 9/11 thing? You: If it makes you feel any better, I’m sure New York City emerged relatively unscathed from the filming of the movie. It was all special effects, movie magic, video voodoo. No worries, right? Me: Yeah, I know. It shouldn’t bother me. It’s just that it seemed like those special effects people were having too much fun. Did you see the way they totally trashed Grand Central Station? They didn’t have to do that. That was out of bounds, man, way out of bounds. You: Let me get this straight. The special effects people had too much fun destroying a computer-generated version of Manhattan? Do I have that right? That’s the criticism you want to level at this movie? Me: Yes, that’s definitely one. You: So, I suppose that means that you didn’t like the movie then. Me: I didn’t say that. Just next time, CGI effects trolls, leave Grand Central Station out of it, that’s all I’m saying. You: Well, if we can get past that… You know, one of the things I absolutely loved about this movie was the way the characters fought at the beginning, and how their relationships evolved over the course of the movie. You: Are you kidding me? Just okay?! Me: No, you’re right; it was great. I’m just trying to get my enthusiasm back. I’ll be fine in a few minutes. You go on. You: Oh, c’mon! How awesome was it to see Thor and Hulk wailing on each other? 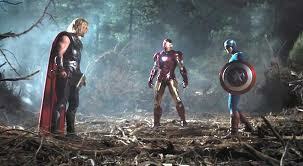 Or that three-way with Iron Man and Thor and Captain America? Even Hawkeye and Black Widow went a few rounds. Me: That Hawkeye/Black Widow melee was hard to follow. It was dark, and they were both wearing black. How stupid was that? 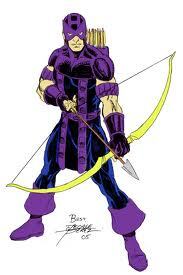 They should’ve had Hawkeye wearing his bright purples so at least you could tell the two apart. You: Geez, do you have a negative comment about everything? Me: Obviously, you’ve never been to the movies with me before. You: So you didn’t like Hawkeye’s uniform? Me: I just want to know why they couldn’t put Hawkeye in some variation of his classic costume. I totally get that purple doesn’t really fit with the whole bird of prey motif, but that was always his thing. Everything was purple with him. He was like Donny Osmond. What would’ve been wrong with paying tribute to that fact and have him show a little purple on his outfit? Me: Well, let them assume whatever they want. Even if he were, which he isn’t, what, we can’t have gay superheroes? What year is this, anyway? 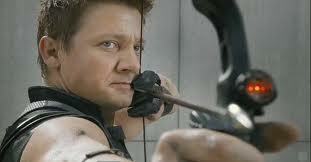 And if Hawkeye had a problem with anyone thinking that, I’m sure he’d be the first to let them know. Probably with a couple of c-5 arrows, right in the baby banks. Me: You know, Hawkeye never did get the respect he deserved. And I always thought he had a highly underrated origin story. You: Does that mean you preferred Hawkeye’s costume in this film then? You: What do you mean? What kind of place? Me: I think we’re spending way too much time talking about costumes. You: Okay, maybe we’ll come back to the costumes later. Me: Can I just say this first, though? 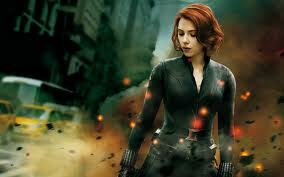 How about that Black Widow? Man, what a babe! I just want to know who in that theatre wasn’t hoping and praying for Black Widow to experience a major wardrobe malfunction, huh? You know what I’m sayin’? I know I was. Yep. You: Have you adequately reestablished your heterosexual identity? Can we continue now? Me: Yeah, I think I'm good now. You: Uh… So, so far, I’ve got that you liked the sound effects mixing of the movie, and didn’t like the pretend destruction of Manhattan or Hawkeye’s outfit. Is there anything else you liked about the movie, ‘cause so far this doesn’t exactly sound like a ringing endorsement. Me: No, not them. 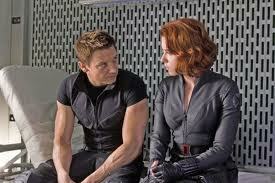 Besides, now I’m a little confused about Hawkeye. No, I’m talking about the love story between Thor and Loki. Me: Yeah, wasn’t it amazing? Oh, that Joss Whedon is a genius! How he was able to intertwine a delicate love story amidst all that mayhem, it’s just boggles the mind! You: But Thor and Loki are brothers! You: Love story? They were trying to kill each other! Me: You don’t have any brothers, do you? You: Well, no… only child. Me: Well, lemme explain the family dynamic in play here. 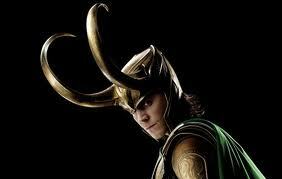 So you’ve got Loki; he’s the little brother who always looked up to his big brother as a model of perfection, right? 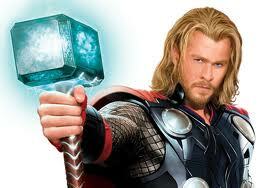 But over the years he gets a little jealous because everything’s all Thor this, and Thor that. It’s nothing but Thor, Thor, Thor all the time, right? It’s like Everybody Loves Raymond, except in this case Ray is Thor, and Robert is Loki. You: Like unleashing an invasion of alien warriors to conquer the earth? Me: Exactly! For Loki, it’s all about the attention, and getting his older brother to say “Wow, little brother, I never realized how hard you rock!” It’s a desperate attempt to finally earn admiration and respect from the one person that matters most. You: But Thor never says anything like that. He just gets pissed, and they have a huge fight. Me: (sniff) Sorry. It’s a brother thing. You: But I still don’t understand. Loki literally tries to kill Thor. Don’t you remember? Just when Thor tries to convince him to work together – remember that part? – he stabs him in the side. Me: Loki wasn’t trying to kill Thor. Me: No, that was just another way of getting his attention. Think about it. How effective is a blade the size of a dinosaur claw going to be on the god of thunder? He didn’t even poison the knife or anything. He wasn’t trying to kill Thor by stabbing him; that was just his way of saying “Hey, big brother, I really wish you’d consider treating me more like an adult, and less like a little kid.” The thing is, they’re both gods, so he can afford to be a little more expressive about it, that’s all. You: I don’t know. What about that huge fight they had? Me: That’s what I’m trying to tell you. Brothers fight all the time. They push each other, they wrestle, they smack each other in the head; brothers do that stuff on a regular basis. 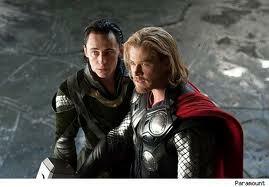 What Thor and Loki were doing is the superhuman version of two brothers trying to give each other tappers. You: Tappers? What’s a tapper? Me: You never roomed with guys in college either, did you? You: Well, no. I had my own dorm. Me: Then you’ll have to take my word for it. If you look underneath all the beating, the punching, the stabbing, they really do care about each other. Underneath all those superhuman tappers, there’s love. Me: With no brothers and no college roommates, it’s no wonder. But don’t sweat it; we all see different things in these movies anyway. So what was something else you liked? You: Well… I was struck by how much depth they were able to give the characters in the movie. Especially the main supers. Each one had a huge internal struggle going on within themselves, in addition to the outer conflicts like learning how to work together as a team and fighting an army of aliens. It really helped to differentiate their personalities, as well as make it easier to see why they would have trouble working with each other. You: Well, start with Iron Man. Tony Stark comes across as this as this arrogant, cynical, condescending egotist, but under the surface you can see that he’s deeply conflicted over his company’s role in creating and producing horribly destructive weapons at Stark Industries. He wasn’t always that way, but seeing his weapons being misused to intimidate and destroy innocent people caused him to have a change of heart. Ha! That’s funny, right? Tony Stark – change of heart, get it? Me: Yeah, it’s funny. Perhaps you don’t realize that I’m supposed to get the good lines. You: I ad-libbed that one. Anyway, seeing the error of his ways, Tony decides he wants Stark Industries out of the military industrial complex, so he turns his focus to pioneering sustainable energy instead. He feels responsible for the way he helped facilitate America’s ‘shock and awe’ mentality, and so he probably thinks that if he can cure our addiction to oil with clean energy that it might reduce our government’s willingness to rely on warfare in lieu of actual foreign policy to solve its problems, which would assuage some of the guilt he feels. Me: Whoa, man, whoa. It’s just a movie. I don’t think the folks at Marvel – or is it Disney – are interested in making a political statement, especially one as outrageously radical as that. You: Well, I happen to think there is something of a message hidden in all that carnage. Anyway, Stark has become very suspicious of shadowy government types like Nick Fury, and schemes like the Avengers Initiative, and the government has become suspicious of him as well, which is why he’s not included in that secretive testing they’re doing on the Tesseract cube. You: What? You didn’t think there were any – I don’t know – hints, at least, about a moral stance being taken in this film? Me: If by ‘moral stance’ you mean ‘don’t be standing anywhere within a half-mile radius when Thor smashes Cap’s shield with his hammer,’ then yes, I did. You: You know, it’s interesting you bring up Captain America. He’s got issues too. Here’s a guy who’s just been thawed out after 70 years as a human bullet-pop. 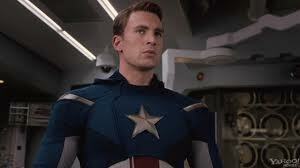 Cap’s a man out of his time, raised on values learned from the Great Depression and the war to defeat fascism. And once he’s had a chance to start looking around, it’s pretty evident he doesn’t entirely approve of the way things have gone since then. He doesn’t know how he fits in this ‘new’ America, or even if he fits in. At the same time, he is Captain America, its one and only super-soldier, charged with defending and protecting the country as only he can. He’s kind of caught in an inner struggle of uncertainty about what he should do now that he’s back. Obviously, he’s a big believer in self-sacrifice and following orders, but he doesn’t follow blindly. He shows that by his skeptical attitude towards Fury and the Avengers Initiative. He also demonstrates that he’s capable of going a little rogue when necessary, like when he sneaks off by himself to find out the truth about SHIELD’s secret project. But I don’t think it’s entirely accidental that Cap has some qualms about the America he came back to. Me: Well, I just attributed those to sour grapes over all the classic TV shows he’s missed over the years. Who wouldn’t be upset about missing great shows like M*A*S*H, and Cheers and Seinfeld? Sour grapes or existential discontent? You: I think it might go a little deeper than that. 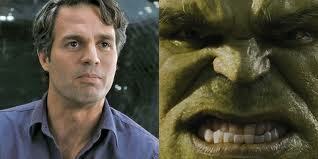 Then you’ve got the Hulk. By the way, I loved Ed Norton as Bruce Banner – I mean loved – but Mark Ruffalo and the script do an amazing job of showing how difficult life is for Banner. This guy has had to sacrifice almost everything he is, both as a man and a scientist, just to try and keep the rest of the world safe from “the other guy.” This film kind of shows you how his struggle is both noble and tragic, but also kind of doomed to failure. And is that so different from what we’ve done, too, as a country, over the last eleven years? Try to guarantee our security and safety from “the other guy,” no matter what the cost? But Banner can’t prevent Hulk from taking over, any more than we can prevent everybody who wants to take a shot at us from doing so, right? Banner has to trade away everything he loves just on the outside chance that it will keep people safe. In fact, we find out it depressed him so much he tried to off himself, but he couldn’t even do that, because the Hulk got in the way, and guess what? We find out the Hulk can’t be killed. Me: That reminds me of the part when Hulk punched Thor. That was funny. You: Yeah, I guess it was, although I don’t really see the connection to the point I’m making. Me: There isn’t one. I just didn’t want people to forget I was here. You: Alright, just one more thing. So, Banner exists in this world of extremes; he’s either completely rational and controlled, or he’s a raging berserker. There’s no balance between reason and emotion, thought and action, control and chaos. It’s just two sides arguing without a center. I don’t know about you, but it reminds me of Congress. You: What? We’re just discussing ideas, right? We’re just two people having a conversation, talking about our thoughts and impressions of a movie. What could possibly be wrong with that? Me: Well, that worker over there just looked at us strange. Now she’s on the phone. I think she might be reporting us. You: To whom? Marvel? Disney? The movie police? Me: Wise up, man! The government! 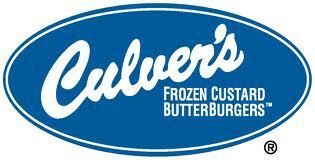 You: You think that Culver’s employee might be a spy? A government plant, waiting for people like us to come into a custard place and have seditious conversations inspired by superhero movies? Me: Shhh! Keep it down, man. She can hear you! You: Okay, suddenly that whole thing about special effects people messing up a computer-generated version of Manhattan makes perfect sense. Me: All’s I know is I don’t want to be turned into a black splat on the asphalt by some unmanned drone that might be circling over us as we speak. You: That’s insane. We’re American citizens. We have rights. Me: Yeah, well, this whole conversation’s making me nervous. I didn’t know that I had just seen a movie that was so anti-American. DC would never do something like that. You: Who said anything about anti-American? Since when is questioning your government anti-American? By that definition, the Revolutionary War was anti-American. Me: Can we just change the subject and talk about something a little less threatening, like The Hunger Games? You: I guess so. Besides, I’m starving, and we haven’t even started eating yet. Me: Eating? We haven’t even ordered. (To clerk) Hi, I’ll have the double ButterBurger with cheese, a side of onion rings, a medium drink, and a small Nestle Crunch concrete mixer. Me: You’re right. Let’s make that a large, Hershey’s concrete mixer. You can’t get more American than Hershey’s, right? Note: I only realized much later that, in cutting our conversation short, we never answered the original question of how good The Avengers was. Perhaps there will be an Avengers Dialogue, Part Two someday. If there is, you can bet it won’t be in line at a Culver’s, but in a very dark, very quiet, and very secure location.